If your band has built a solid and extensive fan base and network of peers, congratulations, you’re a few steps ahead of the game! Now, what do you do with those connections? There’s a concept, albeit not that new, called crowdsourcing. It is “the practice of obtaining needed services, ideas, or content by soliciting contributions from a large group of people,” and it has a number of applications that could apply to bands and musicians. One variation of crowdsourcing is crowdfunding, in which a large targeted group of people choose to invest in a cause. For musicians, this concept can be used to raise money for a recording session, music video, or new album release. However, this is not the only way that musicians can use the crowdsourcing concept. If you’re a fairly new act, ask your friends and fans what upcoming local gigs they’re looking forward to; if those acts fit your niche, see if those shows or venues need opening acts. Being able to tell a booking agent or promoter that your fans already love coming to their venue is a plus. If you’re looking for recommendations on great places to play or venues to avoid, use your peer network and ask other bands in the area (those you can trust). If your band is thinking about hitting the road, ask your online fan base where your band should stop on its tour. Map out a route with the locations that will give you a good crowd. Once you have a tentative route planned, start asking fans about their favorite venues and local bands in those cities. The local bands might have shows you could get in on, drawing crowds from both of your fan bases. Since not all venues provide lodging, ask the fans and local bands around about lodging, too. They might recommend places that you wouldn’t have otherwise known about, provide tips on getting a good deal at a place, or—if you’re lucky—offer to let you crash at their house. Not much beats a few welcoming faces and a home-cooked meal, and it gives you an incredible opportunity to connect with your fans. Plus, it beats sleeping in the van. If your crowdsourcing brings up another band’s tour, look into the group and their plan. Should your sounds and vibes be complimentary to each other, touring together could benefit you both. Your differences might draw separate crowds, resulting in increased profits from gigs and possibly helping you win over fans that you wouldn’t have reached on your own. The key is finding balance; bands too similar or too different can cause more hassle than benefits. If you can’t tour with another band, and if you won’t be competing for their fans’ attention, try learning from what they’re doing. Ask what gigs they have planned and how they spaced out their tour dates. Ask which venues worked well for them and which flopped. If the bands on tour won’t share information, talk to your existing peer network to see what tips and advice they have. Crowdsourcing has a number of other uses that could work for a band. If you’re trying to determine which songs make it onto the next album, play samples and have them vote their favorites onto the album. If you need album artwork, you could turn to your fan base for recommendations of designer or for the design work itself. Or, you could ask them to vote on the design concepts, use the winning design for your album. The same idea (voting on design concepts) applies to t-shirt or merchandise design. Speaking of merch, you can also ask your fans what merch they want you to offer. Lastly (for the examples), you can crowdsource your promotions by creating a team of dedicated super-fans. Ideally, this team would be geographically spread out. While they can help moderate forums and assist with promotions online, you also want to work with them to promote your events in their area before you get to town. Crowdsourcing is simply using those around you (as a band, mainly your peers and your fans) as a resource. Whether you’re playing locally or hitting the road, don’t forget to incorporate this technique into your band’s strategy. 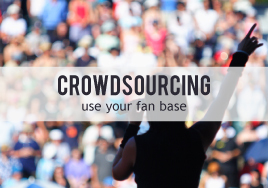 Has your brand used crowdsourcing to make a decision, reach a goal, or build your fan base? How did you use it, and what was the result? Ray, yes, we have several. We’re also open to doing additional articles, so let us know if you have particular questions.